President Donald Trump's son told Congress he didn't think there was anything wrong with meeting a Russian lawyer at Trump Tower in hopes of election-season dirt on Hillary Clinton. That's according to transcripts released Wednesday. Donald Trump Jr. was asked if he was troubled by the idea that the meeting in June 2016 was part of a Russian government effort to help his father in the presidential race. He said he didn't give it much thought. The Senate intelligence committee says it agrees with a 2017 assessment by intelligence agencies that Russia intervened in the presidential election earlier to hurt the candidacy of Democrat Hillary Clinton and to help Donald Trump. Senate Intelligence Committee Chairman Richard Burr said in a statement Wednesday that his staff has spent 14 months "reviewing the sources, tradecraft, and analytic work, and we see no reason to dispute the conclusions." That's in contrast to the House intelligence committee, which agreed with the majority of the report but said last month that the agencies "did not employ proper analytic tradecraft" while assessing Russian president Vladimir Putin's intentions. Lawmakers on that committee said they agreed that Putin had wanted to hurt Clinton, but did not agree that meant he wanted to help Trump. An attendee of the June 2016 Trump Tower meeting told congressional investigators he was "concerned" about discussing negative information about Hillary Clinton. Ike Kaveladze told the Senate Judiciary Committee last year that he learned from an associate days before the sit-down that Russian pop singer Emin Agalarov mentioned the possibility of political dirt. Kaveladze works for Agalarov's father, a Russian developer who partnered with Donald Trump to host the Miss Universe contest in Moscow in 2013. Kaveladze said he was troubled by the "morality and ethics of the situation," more than potential legal issues. He said he supported Clinton politically. Kaveladze told investigators his concern was assuaged in a pre-meeting lunch with Russian lawyer Natalia Vaselnitskaya who said the Trump Tower meeting would strictly stick to the Magnitsky Act. Donald Trump Jr. says he was "candid and forthright" in answering questions by the Senate Judiciary Committee in the Russia investigation. The panel has released more than 1,800 pages of transcripts of interviews with Trump Jr. and others who attended a June 9, 2016, meeting with a Russia lawyer. According to emails, Trump Jr. was promised dirt about Trump's opponent, Democrat Hillary Clinton. In a statement Wednesday, Trump Jr. says "The public can now see that for over five hours I answered every question asked and was candid and forthright with the committee." Trump Jr. thanked the members of the committee for "their courtesy and professionalism." Donald Trump Jr. says he received direct messages via Twitter from WikiLeaks asking if he would leak his father's tax return. That's according to transcripts of his interview last year with the Senate Judiciary Committee released on Wednesday. Trump Jr. says he never communicated with Julian Assange, the head of WikiLeaks. He described the person who contacted him via Twitter as "a lady that appeared to work at a law firm, if I recall correctly." Trump Jr. said the organization would "reach out on a few occasions sort of passing along news" and suggesting that he tweet it. He says he thinks the only time he responded was to say, "Hey, when (am I) going to receive the next leak"? He said he was not aware whether anyone else on the campaign had contact with WikiLeaks. Donald Trump Jr. is acknowledging that his father may have been involved in drafting a press statement last year that attempted to explain a June 2016 meeting at Trump Tower with a Russian attorney. That's according to transcripts of Trump Jr.'s testimony before the Senate Judiciary committee. At first, Trump Jr. told the panel he didn't know if his father was involved in drafting the statement. But he later acknowledged that the president may have edited it through his close aide Hope Hicks. The statement's drafting has been under scrutiny by the committee and special counsel Robert Mueller. The statement described the meeting as being about Russian adoption but left out that Trump Jr. had been told it was part of a Russian government effort to aid the campaign. Donald Trump Jr. shut down the June 2016 meeting at Trump Tower by telling his Russian guests perhaps they'd revisit the discussion about lifting sanctions legislation should his father win the election. That's according to Ike Kaveladze, who told the Senate Judiciary Committee the sit-down between a Russian lawyer and top Trump campaign officials was dominated by talk of the Magnitsky Act. The congressional panel released Kaveladze's transcript from the November 2017 interview on Wednesday. Kaveladze works for Aras Agalarov, a Russian developer who helped organize the meeting with his pop singer son, Emin. Kaveladze told congressional investigators the campaign staffers appeared unimpressed by the meeting. He said Paul Manafort didn't look up from his phone and Jared Kushner asked aloud why they were there "listening to that Magnitsky Act story." The Senate intelligence committee is questioning top Obama administration intelligence officials about the intelligence agencies' assessment about Russian meddling in the 2016 president election. Former National Intelligence Director James Clapper, former CIA director John Brennan and former National Security Agency director Mike Rogers headed into a classified meeting Wednesday with members of the committee. Former FBI Director James Comey had been invited as well, but his attorney, David Kelley, said he had a "prior commitment" and could not attend. The intelligence agencies' assessment concluded that the Russian government interfered in the election and that Russian military intelligence provided hacked information from the Democratic National Committee and senior Democratic officials to the website WikiLeaks. WikiLeaks has denied that Russia was the source of the stolen emails. Donald Trump Jr. says he doesn't remember a lot when it comes to the circumstances around a June 2016 meeting at Trump Tower with a Russian attorney. Transcripts released Wednesday detail an interview the president's eldest son gave to the Senate Judiciary Committee last year. They show that Trump Jr. says he doesn't remember ever discussing the Russia investigation at all with his father. He also doesn't recall several emails and phone calls leading up to the meeting or even that a Russian-American lobbyist, Rinat Akhmetshin, attended. That's despite another attendee recalling that Akhmetshin was dressed in hot pink jeans and a hot pink shirt that day. Senate Judiciary Committee Democrats say interview transcripts detailing a 2016 meeting between Trump campaign officials and a Russian lawyer are just "one piece of a much larger puzzle." The Democrats say the transcripts do not tell the full story of the meeting because some participants were not interviewed and Senate Judiciary Chairman Chuck Grassley was unwilling to subpoena them. Without interviews of former Trump campaign chairman Paul Manafort, adviser Jared Kushner and others, Democrats say "much of the truth remains hidden." In a list of findings, the Democrats say that Donald Trump Jr.'s willingness to take the meeting with Russian attorney Natalia Veselnitskaya "confirms that the Trump campaign was willing to accept Russia's assistance." The interviews were part of the panel's investigation into Russian meddling in the 2016 election. 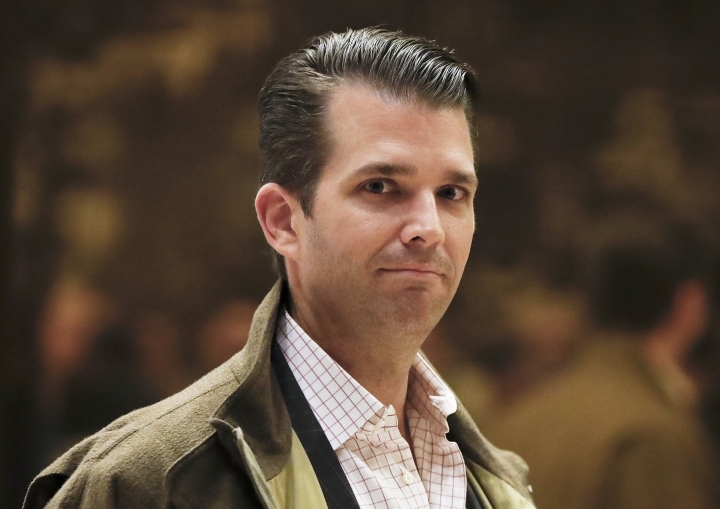 Donald Trump Jr. told the Senate Judiciary Committee that he couldn't remember whether he had discussed the Russia investigation with his father. That's according to transcripts of his interview with the panel last year. The committee on Wednesday released more than 1,800 pages of transcripts of interviews with Trump's son and others who met with a Russian attorney at Trump Tower ahead of the 2016 election. The meeting is under scrutiny in special counsel Robert Mueller's Russia investigation.